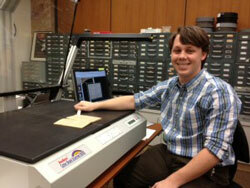 The Digital Library recently welcomed its first Digital Humanities intern, Conor Hafertepe. To learn about Hafertepe and the Aurelius Digital Humanities Initiative, please go to the Aurelius web site. The Aurelius Digital Humanities Initiative (ADHI) is a project of Falvey Memorial Library to support digital humanities (DH) projects and promote a DH community here at Villanova.